ARTISTIC PROCESS - Site de johanneblaquiere ! My passion for horses goes back to my childhood. From memories, I see an image, a stable where I spent time with my aunt a well-known Canadian painter of animals. My interest for painting developed while young, amazed at the works of my aunt, she impressed and stimulated me to draw. I drew everywhere. On the cover of my school books and my writing desk. I scrawled nervously with a pen on a piece of paper during my phone conversations or in full reflection. My subject? Always the horse. There are many other subjects, but the horse keeps an idyllic place in my mind. Now he reigns Master of my workshop. Some great masters such as Rosa Bonheur, Theodore Gericault, and James Ayer, have provided additional inspiration. Firstly, Bonheur for strength, precision and her faithful depiction of horses. Gericault for his talent to restore the essential nature of the horse by narrow centrings which highlight the untamed spirit of the animal. Finally, the American painter Ayers, painting the Native American of which I hold great respect and interest. The Native American occupies a privileged place in my work. 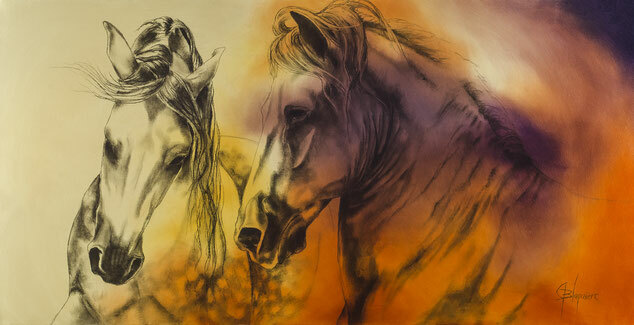 My horses are represented in a variety of ways, whether it be in transparency giving the effect to dissolve into the background, or a more realistic tradition of figurative art. Within these two forms of composition, an element remains unchanged, in the observation that the spectator feels the soul of every horse I create on canvas. When my mediums overlap, whether it be acrylic, oil, watercolor or charcoal, with my brush, I sculpt the line so as to bring to the foreground, the white light from the black light. 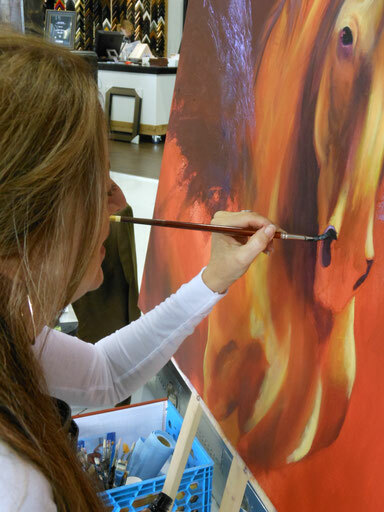 Creating on a bottom of black gesso, the pigments of colors applied for the dress of the horse, intensifying the movement. I can not stop with only a single technique in my creations. The explorations impose a refined search in my pictorial composition. It is within the rhythm of their hoofs that colors appear. My color palette stays the most diversified and contains colors not limited to realistic tints. I believe, a white horse emanates all colors except white. Warm, cold, transparent or opaque colors make these magnificent creatures leap from the canvas. The fusion of my two passions, horses and painting, have served to discover my eternal animal instinct ... and to follow it!